The bad news …. this bundle sale has ended. 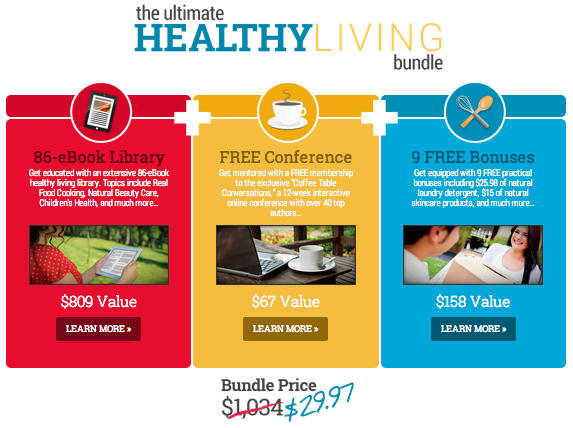 The good news … a whole new bundle sale will be coordinated again next year by the amazing Healthy Living Bundle Team. Stay tuned! Why wait until January to resolve to make healthy changes? Why not make a significant difference in your health (and your family’s) starting right now! If you’ve followed this site for awhile, you know that there is just one bundle sale that I endorse, and that’s because it’s the one bundle that I always look forward to purchasing myself – The Ultimate Healthy Living Bundle. And I couldn’t be more excited about this particular bundle collection! That’s because all of the resources needed to start (or continue progressing) on the healthy living journey are right here in the Ultimate Healthy Living Bundle! Psst! The creators of this amazing bundle added PAYPAL as an option – so paypal away, if that’s your preferred purchase option! Thanks, Healthy Living Bundle Team! In fact, you’ll receive more than $1,000 in healthy living resources for less than $30, including 80+ books on topics such as healthy living, real food recipes, meal planning, fitness, natural skin care and more! Not to mention the ability to interface with the authors in the bundle sale via exclusive weekly interactive online conferences covering key health topics that are designed to both encourage and educate. Are you still on the fence about the Ultimate Healthy Living Bundle? 1. Help yourself and your family, while helping others. As mentioned, there are SO MANY amazing resources in this bundle specifically coordinated to help you and your family to live healthier. And by purchasing the bundle here at The Nourishing Home, you’ll be partnering with me to meet the daily life needs of children and families across the globe – that’s because I am donating 50% of ALL proceeds I receive from this sale to Samaritan’s Purse. And the creators of the bundle are donating 25% of their proceeds to various charities as well! 2. Help your friends and extended family, while also helping yourself and those most in need! You might be wondering what to do with 80+ eBooks? And although I’m pretty certain that we could all benefit from many of the books provided in this bundle, I’m even more confident that each of us could easily jot down the names of at least a dozen friends and family members who could benefit from many of the books in this amazing collection as well. So why not keep the books that you need most and share the wealth by passing the rest of them along to family and friends as a thoughtful gift (especially with Christmas right around the corner!). Again, no pressure! If you are not interested in the sale, please don’t be offended by my excitement over it. Remember, this the only bundle sale you’ll ever see me promote. But if you are interested in taking advantage of this amazing collection of healthy living resources, then there is some pressure … since December 2 is the LAST DAY to take advantage of this amazing sale! The Ultimate Healthy Living Bundle sales ends at 11:59pm on Monday, December 2, 2013. So if you don’t want to miss out, please purchase your bundle here and partner with me to make a difference in the lives of others. Thank you, friends! 5 Tips to Make Lunch Packing Easier!